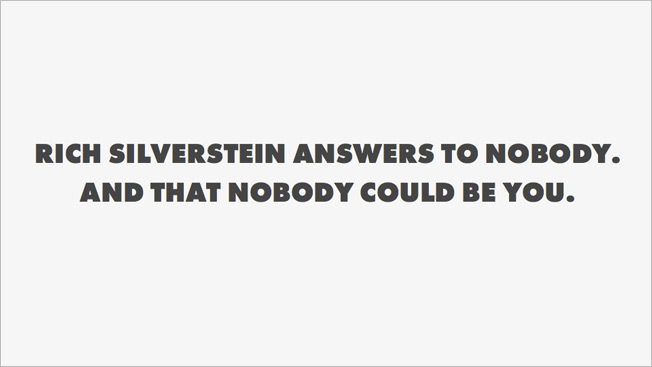 Ready to work for Rich Silverstein? Have you ever looked greatness in the eyes—and cried because it was so damn beautiful it hurt your feelings? Rich has been inducted into halls of fame—yes, plural. His achievements read like a novel, albeit one written by Stephen King. Then there's a list of prerequisites for the job (one of them is that you must not be "an agency spy. Or ever have written for AgencySpy"), along with a link to work4rich.com. That's where things get truly cray cray, as the application process turns out to be a series of ludicrous Web challenges, including transcribing a fast talker's gibberish and memorizing a set of names in just two seconds. You have until Sept. 6 to get past that step in the process, and then "Rich will handpick his favorites and invite them to the Google Hangout of the century." That should be a doozy. Yes, that's right, you enjoy your current job just fine, thank you.